Quite often sushi is served by the piece. That makes it easy to over-order. If you want to save calories, carbs and/or points, order "light rice." To make your meal more filling, bulk it up with an order of oshitashi (boiled spinach with soy sauce). Studies show that people who start their meals with healthy soup end up eating fewer calories. 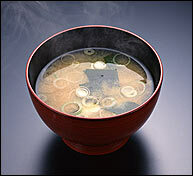 Miso, with around just 50 calories per cup, certainly falls into that category. Try it with clams, mushrooms or tofu. Yum! "Tempura" - Tempura is basically Japanese for "batter fried." Tempura = a fatfest! 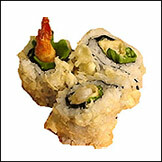 "Spider" - Spider rolls are usually greasy fried crab rolls. They sound good, but they really pack in calories and fat. 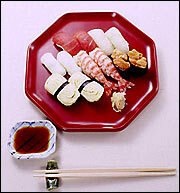 "Dynamite" - In sushi-land, the word "dynamite" basically means, "baked in a sea of gooey mayo." Skip it! "Crunch" - Yet another cute & clever way of saying "fried & fatty." Cucumber Roll - This crunchy, healthy delight packs in just 130 calories & no fat! Spicy Tuna Roll - If made with a small amount of mayo, one of these will likely contain between 250 - 290 calories, and 5 - 10g of fat. 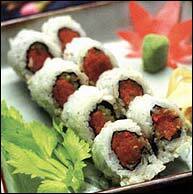 California Roll - Order without mayo, and this one will set you back about 275 - 300 calories, and have 5 - 10g of fat. Save calories by asking your sushi chef to go easy on the rice. Some sushi restaurants offer brown rice, which is better for you than white. If you see it, got for it! In need of another healthy sushi starter? 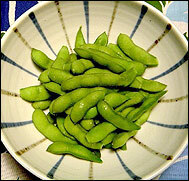 Go for edamame. 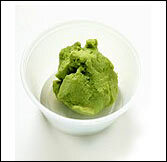 A 1/2 cup serving contains 127 calories, 6g fat and 4g fiber (2 points). Share this email with raw fish lovers everywhere. Click "send to a friend" NOW!